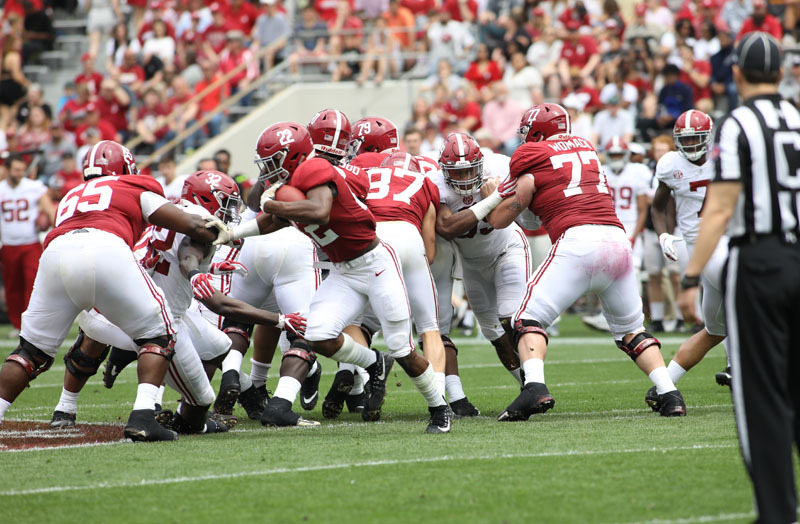 Team captains for the 2019 Golden Flake A-Day Game for the Crimson Team were tight end Miller Forristall, quarterback Tua Tagovailoa and offensive lineman Matt Womack; for the White Team, defensive lineman Raekwon Davis, defensive back Xavier McKinney and linebacker Dylan Moses. 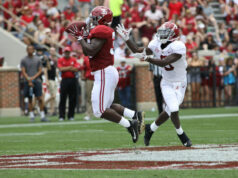 The official estimated attendance at the 2019 Golden Flake A-Day Game was 62,219 at Bryant-Denny Stadium (capacity: 101,821), the 13th-largest attendance mark for an A-Day football game. The top attendance totals for Alabama’s A-Day Game. 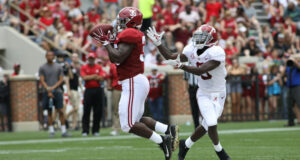 The University of Alabama football team and head coach Nick Saban wrapped up spring practice today with the 2019 Golden Flake A-Day Game at Bryant-Denny Stadium. 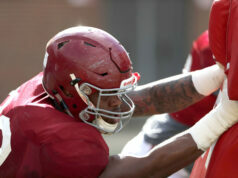 Alabama opened spring practice on Friday, March 8, and held 14 practices through Thursday, April 11, leading up to today’s A-Day game. 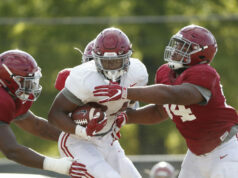 The Crimson Tide also held two scrimmages here at Bryant-Denny Stadium this spring (March 30 and April 6) in preparation for today’s game. The four permanent team captains from the 2018 season – running back Damien Harris, tight end Hale Hentges, linebacker Christian Miller and offensive lineman Ross Pierschbacher – were recognized at the annual Walk of Fame ceremony that took place Saturday at 11:15 a.m. at Denny Chimes. Per Alabama tradition, all four captains had their hand prints and foot prints placed in cement at the base of Denny Chimes in recognition of the leadership, commitment and excellence in representing the Crimson Tide. The format for the A-Day game was much like a normal game, with a few minor variations primarily regarding the game clock. The game consisted of four 15-minute quarters with a running clock. The clock stopped only following scoring plays, penalties, and changes of possession. Regular clock rules were used during the final minutes of the second quarter and the fourth quarter. Halftime was 12 minutes in duration. Players wearing black jerseys (quarterbacks and injured players) were considered “tag-off” and were not treated as live players. The kickoffs and kick returns were “tag-off” plays as well, with the ball spotted at the 30-yard line.